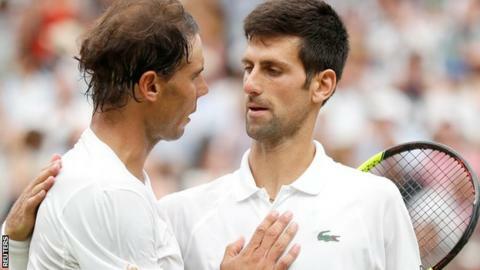 Rafael Nadal and Novak Djokovic will wait to decide whether to play an exhibition match in Saudi Arabia, following the murder of Saudi journalist Jamal Khashoggi in Istanbul. Turkish officials believe Mr Khashoggi - a critic of the Saudi government - was murdered and his body dismembered. The world's top two ranked players are due to meet in Jeddah on 22 December. Djokovic said: "My team is in touch with Saudi Arabia and we're all talking to understand the situation better." Other sports events have taken place in Saudi Arabia since Khashoggi was killed, such as Brazil's football international against Argentina on 16 October. Serb Djokovic, 31, said: "I don't like to involve myself in any political exchange or situations. And it's unfortunate that we are both drawn into this right now. "Right now we just don't have obviously enough information, and we have to look into that a bit more and then we'll make our decision soon." World number one Nadal added: "Of course I'm aware of all the situation. But I had a commitment since one year ago to play there. And my team is talking to them, to analyse the things. That's it. "It's terrible that one journalist lost his life. I know something happened very bad inside there. So we are looking about how evolves the situation and I hope the things will clarify as soon as possible."